The Vancouver Winter Olympic Game Silver Maple Leaf Coin Series ran from 2008 to 2010. This collectible silver bullion coin series is issued by the Royal Canadian Mint (RCM). Struck in fine .9999 silver. These silver bullion coins pay homage to the spirit of the Olympic Games. The coin's content and purity are guaranteed by the Government of Canada. Silver Olympic Coin delivery to door? The safe shipment of silver coins through fully insured mail is more common than you might think. The majority of our customers take fully insured, physical silver delivery discretely to their door. Upon your full payment clearance, your order with Kitco Metals is shipped packed tightly in a nondescript parcel. All bullion order parcels are shipped with full insurance, tracking information, and adult signature requirements. 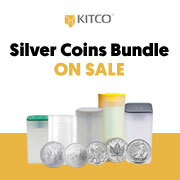 You can store your 2009 1 oz Silver Maple Leaf Olympic Edition Coin safely and securely with Kitco Allocated Storage. Kitco offers you global options for gold, silver and platinum bullion storage that is fully segregated, insured and allocated. Kitco's network of top-tier vaults includes some of the most secure storage facilities in the world, in Canada, Hong Kong or the United States (COMEX approved). Cayman Islands storage is also available (certain conditions apply). Find out more about keeping your gold, silver and platinum purchases secure, with our Global Precious Metals Storage Solutions. Kitco is the trusted leader in the precious metals industry. Gold, silver and other precious metals sold by Kitco are recognized in bullion markets around the world. With our core focus on gold and silver bullion, you benefit from pricing and premiums that are highly competitive in the industry. At Kitco, we make it easy for you to manage your wealth. You can sell or buy silver coins and other precious metals using our convenient online store, or by contacting our team of highly trained precious metals specialists. Backed by our global information network, Kitco is proudly serving our customers since 1977. The 2009 1 oz Silver Maple Leaf Olympic Coin(s) you receive may not be in absolute mint condition.